In a sealed document leaked online late Thursday afternoon, a Bureau of Land Management employee alleges vast misconduct by his agency during its investigation of the 2014 armed standoff between the government and supporters of Nevada rancher Cliven Bundy. The document is the latest twist in a tumultuous federal trial of Bundy, his sons Ammon and Ryan, and Montana militiaman Ryan Payne that began Nov. 14. The document began circulating after Republican Washington state Rep. Matt Shea read parts of it in a live-stream video on Thursday. The document was acquired by the Oregonian and posted on pro-Bundy media sites yesterday. HCN has independently reviewed the document. The Interior Department and did not respond to request for comment by press time; the Bureau of Land Management declined to comment. Wooten, who is based in Idaho, describes himself as the lead investigator regarding the failed government impoundment of Bundy’s cattle that were grazing illegally on public land. 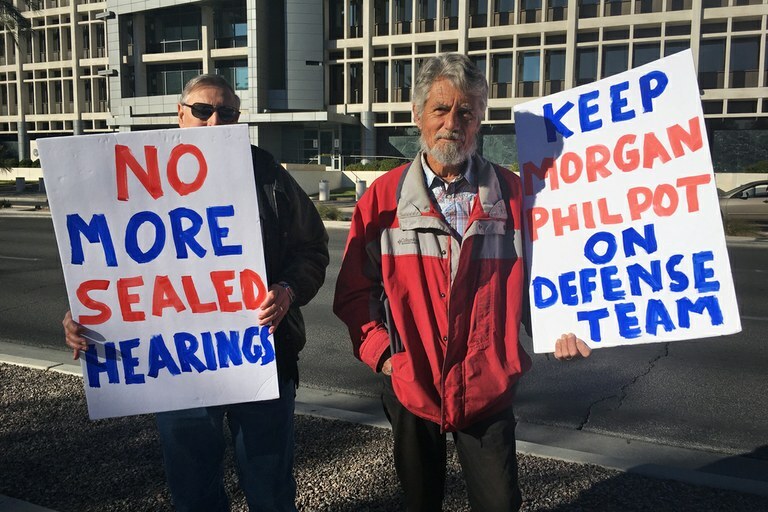 The investigation began following the April 12, 2014 standoff to assist U.S. attorneys in their case against the Bundys and several supporters. It was what Wooten calls “the largest and most expansive and important investigation ever within the Department of Interior.” The document states he was in this role for nearly three years before higher-ups removed him from the investigation in February 2017. On Dec. 15, 2017 Ron Miller and Neil Wampler stand outside the Las Vegas federal courthouse to support the Bundy family and other defendants in a trial related to the 2014 standoff with the federal government. In the document, Wooten says his intent is not to defend the Bundys. “This investigation also showed that subjects of the investigation in part adopted an aggressive and bully type strategy that ultimately led to the shutdown of I-15, where many armed followers of Cliven Bundy brandished and pointed weapons at the Federal Officers and the Agents in the Toquop Wash near Bunkerville, Nevada." However, the document could undermine the government’s case against the Bundy family and its supporters. Prosecutors provided the Wooten document to the Bundy defense team on Dec. 8. Cliven Bundy’s attorney Bret Whipple and Ammon Bundy’s co-counsel Morgan Philpot filed a motion to dismiss the case based on the Wooten document, on Dec. 11. A spokesperson for the U.S. Attorney’s Office declined to comment. Their motion was the latest in a long series filed by the defense in recent months. Unrelated to the Wooten document, prosecutors filed a response yesterday to earlier motions to dismiss based on allegations that the government has not been forthcoming with evidence throughout the trial. U.S. District Court Judge of Nevada Gloria Navarro is expected to rule on those motions early next week. Tay Wiles is an associate editor at High Country News and can be reached at [email protected].